The North-Pacific-Gyre is a menu of sludgy toxic soup. This oceanic-garbage-patch sadly impacts wildlife, the natural food chain, and is one heck of a carbon-footprint. Ever heard of a gyre? A gyre is a large circular group of ocean currents that spiral around. There are many gyres actually. The north-pacific-gyre is the one we hear about the most because of its' ability to collect all kinds of debris. It is estimated to be the size of 7 - 9 million square miles. Also referred to as the Pacific-Trash-Vortex, this patch is a more concentrated area of debris in the north Pacific ocean. 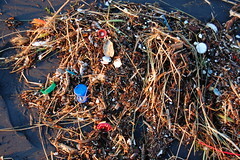 This area consists of typically lost and entangled fisherman nets and equipment, and general debris, but it mostly consists of different forms of everyday plastic items that land here. Other pieces are so small and tiny as a group, they form a type of soupy plastic concoction that just "hangs" below the surface. Anything and everything gets caught in it, including microscopic wildlife, so important to our ocean system. Evidence of mind-boggling plastic-pollution is everywhere. Pens, markers, toothbrushes, bags, you name it, it's all found floating or swirling around in a continuous journey that goes nowhere out there. The small plastic pieces are hard to see sometimes because they are just below the top of the water. Photos of container samples of water produce a barely clear thick looking liquid just loaded with tiny bits of colored pieces of "stuff" which are indeed partially decomposed bits of plastic. Cleanup isn't really easy to do, in fact, it's pretty much next to impossible. After all, the whole ocean would have to be skimmed, and cleaning up would have to take into consideration other equally big challenges that would play a huge part in so gigantic an operation. First of all, these areas or gyres, move constantly and are incredibly huge. Transport, fuel, and just how to proceed is difficult to figure. Marine life such as much needed plankton also exists in the gyres. How do you remove what you have to without obliterating the plankton as well? Even the beach sand would have to be sifted to remove the concentrated garbage, plastics and debris. Can we even begin to imagine what kind of a massive undertaking this would be? So where does it all come from? Who is responsible for this ocean-garbage-patch? Us of course. It is estimated that 80 percent is land-based which include storm drains to a degree, and 20 percent comes from working ships and cruise ships. But, it's the suspended plastic in the north-pacific-gyre that has such an impact. The tiny pieces in the meantime ingested by wildlife only by accident, and other aquatic organisms are definately not doing them any good. There are pictures of dead birds, the very young and mature, that shows quite vividly as they decompose, that their stomachs are full of plastic pieces. They really were fooled into thinking this plastic soup was a good meal! The chemicals, namely Bisphenol-A used to strengthen plastic, are leached into the water and are quite toxic. This chemical in particular is linked though not conclusive, to genital deformities and different cancers of the body. As they are ingested by small wildlife, and then ingested in turn by larger wildlife who prey upon them, the catastrophic effects and results move up the food chain. Over 260 species worldwide are affected by this plastic marine garbage. And what about the fish we eat? If they have consumed this toxic chemical sludge, aren't we consuming it too? The video is very telling, don't you think? If the pictures of the north-pacific-gyre and all that it means isn't enough to make us think twice about everything we buy or don't buy, recycle or don't recycle properly, then I'm not sure what could.